So when Daniel & I got married I disregarded his cook book collection for the most part. I didn't mean to be a snob, but really what did More Swamp Cooking & Manifold Destiny (cooking on your car engine) have that I might want to cook? I'm not sure why but one day I opened Daniel's The Joy of Cooking. I had never heard of this cookbook, in my parents home the 70's edition Betty Crocker, The Mississippi Cookbook, and Bells Best were the everyday cookbooks. I fell in love with this cookbook. To this day it is one of my favorites. Why? 1) It has great basic recipes for new cooks- oven fried chicken, mashed potatoes, etc. 2) It has a recipe for almost every food you can think of- lamb ribs, boston baked beans, asparagus soup. 3) There are great write ups on many culinary subjects, for example a heading about different cuts of roast and how they should be cooked differently. Well I was thinking of buying a copy for a gift. So I go to Amazon and there is controversy in the Joy of Cooking land. Apparently there is dispute about which edition is best. 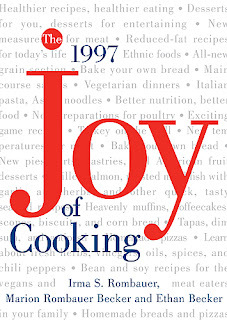 My beloved cookbook is the 1997 edition. Who cares about trifling editions? Well apparently some people really don't like 97' because ice cream, drink recipes, and short-cuts such as condensed soups were left out. Well those changes suit me fine because I buy ice cream and don't like condensed soups. I'd prefer to make my own sauces, for those that like these things there is the all new 2006 75th Anniversary edition. I decided after much research that this may be a better gift for my occasion. Any comments? please tell me if you have an opinion on this.